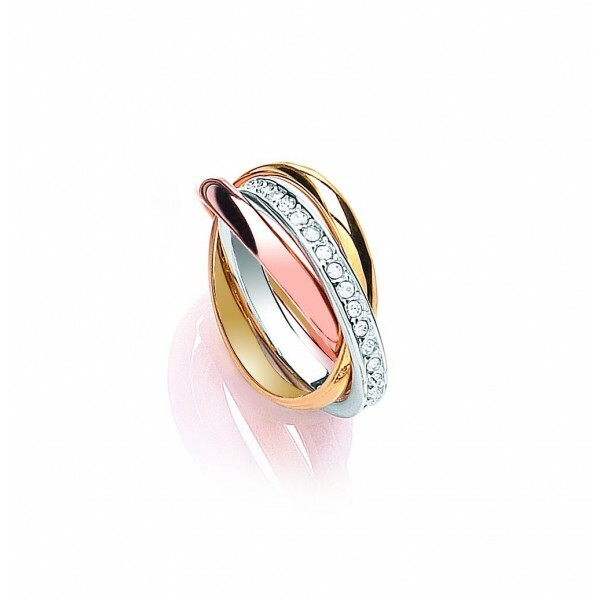 The design of the Russian Sparkle Items combines the classic gold plating with the modern touch of cool rhodium and a warm, feminine touch of the rose gold, creating a timeless collection that will compliment its wearer on any occasion. The sparkling oktant crystals add a touch of glamour to this classic collection. The ring consists of three bands each plated with 18k Gold, Rose Gold, and Rhodium, and hand set with the finest cubic zirconia. The Russian channel set ring is available in sizes small (UK size L), medium (UK size O) and large (UK size Q), please ensure you select a size. View our ring size conversion guide.